Based on my experience as a financial planner and a partner of Atkinsons Chartered Accountants, most Americans have no clue what they should be spending on their lifestyle. The problem is that most of us are not anticipating the “unexpected” expenses like car repairs and medical bills. It’s rare that these are actually unexpected; it’s more of an issue of failing to plan for those expenses. What follows is some financial advice for anyone who struggles with budgeting in general and budgeting for lifestyle expenses. Bucket #1. Recurring fixed expenses: debt payments, insurance, taxes, utilities, etc. Bucket #2. Lifestyle expenses: food, clothing, entertainment, etc. The real genius of the system is that you start with the third bucket. To find out what your lifestyle really is, you first determine how much of every paycheck you need to be saving toward future expenses. Most Americans don’t do this. We know the roof will eventually need to be replaced, the car will break down, and little Johnny will have medical expenses. We fail to save for these and instead declare a family emergency when they happen, all too often resorting to credit cards to cover the expenses we haven’t planned for. 1) I suggest having the future expense amount deducted from your check and sent straight to a savings account that is your bucket number three. It’s possible to have a savings account that will automatically send a predetermined amount of each deposit to a sub-account titled for the exact expense, like “Vacation Account” “Car Repair Account,” etc. 2) Once this amount is subtracted from your paycheck, you send the rest of it to a fixed expenses checking account that will be used only for paying your monthly fixed expenses. This is bucket number one. 3) Determine your monthly surplus. The final step to determining your lifestyle is to figure out the monthly surplus after all your fixed expenses are paid. Multiply that by 12, then divide by 52 to get the weekly amount you can spend on day-to-day expenses. This is the lifestyle you can afford. Set up a weekly transfer for that amount into a lifestyle checking account that will be for expenses such as food, clothing, eating out, etc. Here’s the good news: you can blow everything in this checking account on a weekly basis. The bad news? If you run out before the next weekly deposit, you can’t transfer more money into it, from anywhere. You may have a few lean days if you haven’t planned well. Since these expenses are figured weekly, you never have more than a few days of deprivation before you have money available again. Many families who have had a tough time managing money have adopted this system and have transformed their financial lives. Kies has created a software program that applies the system automatically. It isn’t available to the general public at this point, but he is licensing financial planners to use it. Ask your financial planner if they have the software available. So what do you think? Do you agree that this system could be useful to you? Could you make it work for you or your family? Let us know what you think. 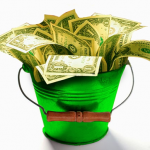 You can learn more about the bucket system by viewing a video here. KFG clients can find out more by emailing us or calling our office at 605-343-1400.